Ethiopia's Gbre-gziabher Gebrmariam, left, leads ahead of Eritrea's Zerenay Tadese, 2nd left, and Ethiopia's Kenenisa Bekele during Men's 10,000 meters race at the World Athletics Championships in Osaka, Japan, August 27, 2007. 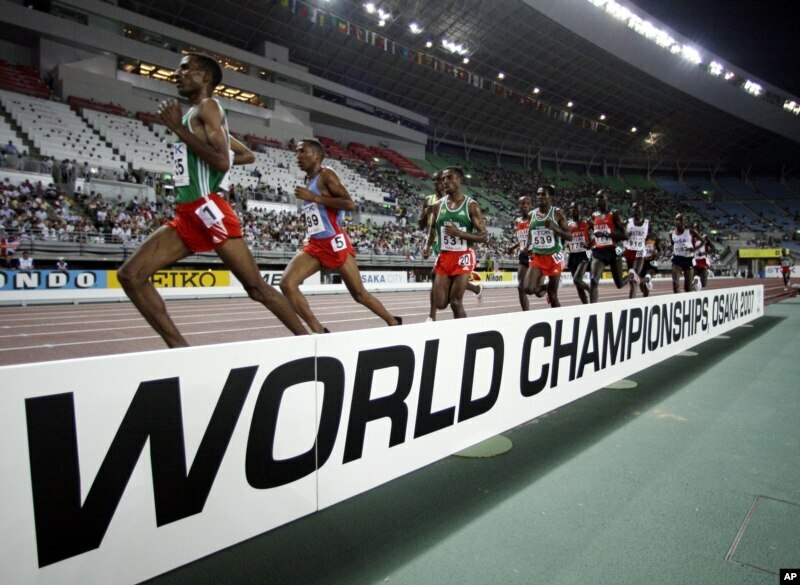 LONDON — As athletes from around the world convene in London, Africa watchers are looking at competitors from the small coastal nation of Eritrea -- not for their skills, but because Eritrean athletes have been defecting in droves from the increasingly restrictive nation. Dozens of athletes have defected in the last decade due to what critics say is to escape an authoritarian regime. ​​As competitors take to the Olympic arena, Eritreans in exile say they will be watching their fellow countrymen. ​​​​​​​​Michael Tesfai, an official at the Eritrean Embassy in London, says the country will field 12 Olympic athletes in several sports, including running and cycling. And, he insists, all 12 are going home. “Because they are Eritreans and they love their homeland, so obviously I expect them to go back to their country, like anyone’s desire,” Tesfai insists. The Olympic crew includes half-marathon silver medallist Zersenay Tadese, who credits his country for his success. But Eritrea does not inspire such patriotism in everyone. The nation’s soccer team first made headlines when four of its players defected during a match in Kenya in 2006. In 2009, the entire team vanished in Kenya after a match. They later resurfaced in Australia. Then, last year, 13 players disappeared in Tanzania. Several of those players have since ended up in the U.S. city of Houston under a refugee resettlement program. Resettlement coordinator Dario Lipovac says he sees the athletes as being very brave for giving up their spots on a top Eritrean team. "All seven of them are very happy to be here, and they're grateful, and of course no one's happy to be out of their country, of course all of them have family there and they miss them," says Lipovac. "But for them, this is a new beginning and we'll make sure that they achieve their full potential. And I hope that we'll see them play soccer on a big level very soon." Eritrean athletes are not the only Olympians who are seeking to leave. Two members of the Cuban women's soccer team defected to Canada earlier this year, and five basketball players recently disappeared during a tournament in Puerto Rico. Decades ago, Soviet athletes drew similar attention. Eritrea has become Africa's top pariah state in recent years. The Red Sea nation has been ruled since its 1993 independence by one man, President Isaias Afewerki. Rights groups say Isaias’ administration has jailed countless political opponents, repressed freedoms and repeatedly postponed elections. Eritrea has gone to war twice with Ethiopia in the last decade. Army service is mandatory. Human Rights Watch's Africa director Daniel Bekele says all of these factors have contributed to an increase in defections over the last decade. Eritreans in exile declined to be interviewed, citing fears it might put their families at risk. But Lipovac, the refugee coordinator in Houston, passed on a message from his soccer players to Eritrea's Olympians: "When you go to London, we will be cheering for you."